As a dietary supplement, take two 500mg Red Reishi 8:1 extract capsules daily. Red Reishi Mushrooms, also known as lingzhi mushrooms or by their scientific name Ganoderma lucidum, have been used for over 2,000 years in Chinese medicine. Red Reishi Mushrooms were first used in Chinese medicine in during the Han Dynasty (206 BC-220 AD) and information about them appear in classical Chinese medical texts. Red Reishi Mushrooms have a striking flat, red-varnished cap shaped similar to a kidney or clamshell, with white or brown pores on the underside. These soft and corky mushrooms have a long history and intriguing appearance, and Red Reishi Mushroom Extract has various purported benefits. Red Reishi Mushroom Extract contains several compounds that lend to its effects including fungal immunomodulatory proteins (FIPs) and ganoderic acids. Other compounds include polysaccharides, notably beta-glucans, and coumarin, mannitol, and alkaloids. 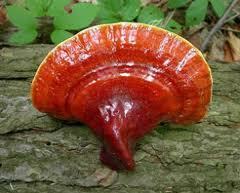 Red Reishi Mushrooms, and mushrooms in general, have two main components: mycelium and fruiting bodies. The mycelium is to a mushroom what roots are to a tree. The fruiting body portion of a mushroom is the stem and cap we see above the surface of the growing media. The whole fruiting body contains the components that are essential to Red Reishi Mushroom benefits, so they are a necessary part of production. The mycelium and subsequent whole fruiting body can be grown on a bed of grain. However, many producers, even the most popular ones, unfortunately only let the mycelium develop to save costs and speed up the process. The mycelium is ground together with the grain and falsely sold as Red Reishi Mushroom Extract. You can actually test this for yourself. Products produced via this method will contain a high amount of starch due to the grain, which can be tested by mixing the mushroom powder with water and a drop of iodine. A dark blue or purple color indicates high starch levels. This is why Nootropics Depot has partnered with Nammex to ensure that our customers can buy Red Reishi Mushroom Extract that is authentic and effective. Nammex’s organic, whole fruiting body extracts contain the essential compounds that make Red Reishi Mushrooms helpful to us. To gain more insight, see the Ganoderma lucidum reviews and experiences below. Did you know not all Red Reishi extracts are made the same? To learn more about the differences between our 1:1 and 8:1 Red Reishi extracts, check out our blog here. Nootropics Depot offers 60ct. or 180ct. jars of Red Reishi Mushroom Capsules (8:1 extract). Nootropics Depot's Red Reishi Mushroom 8:1 extract (Ganoderma lucidum) has been lab-tested and verified for both product purity and identity. You may also like our Red Reishi 8:1 extract powder. Helps me sleep better and feel better overall.